Stratalux, the leading cloud-based managed services provider, names Andre Doumitt to Board of Advisors. Stratalux is all about helping companies build solutions on Amazon Web Services that enable better websites and software products through the use of automation and continuous delivery methods. Stratalux, Inc., the leading cloud-based managed services provider and creator of Private PaaS (Platform-as-a-Service) solutions for companies of all sizes, today announced that it has added Andre Doumitt to its Board of Advisors. Based in Los Angeles, Doumitt currently leads Digital AdopXion, a private company focused on the identification and evaluation of emerging technologies that fit the needs of enterprise-class organizations serving US federal government agencies. Prior to joining Digital AdopXion, Doumitt was CEO of Geosemble Technologies, a software development company focused on providing the “where” solution to Big Data problems faced by large commercial companies, municipal and state governments, and federal government agencies. Geosemble was an early adopter of cloud computing solutions and in 2012 was acquired by Atlanta-based TerraGo Technologies. Doumitt’s experience prior to Geosemble includes a directorship at defense giant BAE Systems, as well as business development roles at Boeing and Bell Helicopter Textron, among others. "As someone who has both built a company and operated in a corporate environment, Doumitt brings a wealth of knowledge on what it takes to be operationally effective," said Jeremy Przygode, Stratalux CEO. "Stratalux is all about helping companies build solutions on Amazon Web Services that enable better websites and software products through the use of automation and continuous delivery methods.” In that context, Doumitt’s wide range of experience with enterprise-class customers will be a tremendous asset to Stratalux." 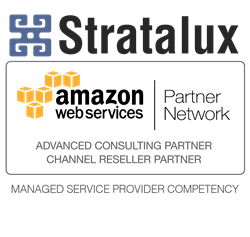 Stratalux, which recently authored the authoritative “The 7 Principals of Highly Effective Cloud Operations" whitepaper, last month was awarded Amazon’s Managed Service Provider Competency designation, which recognizes Stratalux’s strength in building, migrating and managing customer infrastructures on AWS. Stratalux is the leader in building and managing cloud solutions for the enterprise. Focused on building highly trafficked and fully automated website infrastructures for companies on the Internet, Stratalux leverages decades of experience from the world of traditional IT while being recognized as a leader in migrating and managing websites built on public cloud resources. Stratalux partners with best of breed cloud solution providers including Amazon Web Services (AWS), OpsCode, and Rightscale, among others. Stratalux is a technology company, that has a singular focus on cloud technologies enabling its customers to focus on what’s really important; their businesses. To learn more about Stratalux visit us at, http://www.stratalux.com. Copyright (C) 2013 Stratalux. All rights reserved. Stratalux and the Stratalux logo are registered trademarks of Stratalux, Inc. and/or its affiliates in the U.S. and certain other countries. All other brands, names or trademarks mentioned may be trademarks of their respective owners.